When you’re a designer, there’s nothing more appealing than an empty room, a clean slate. 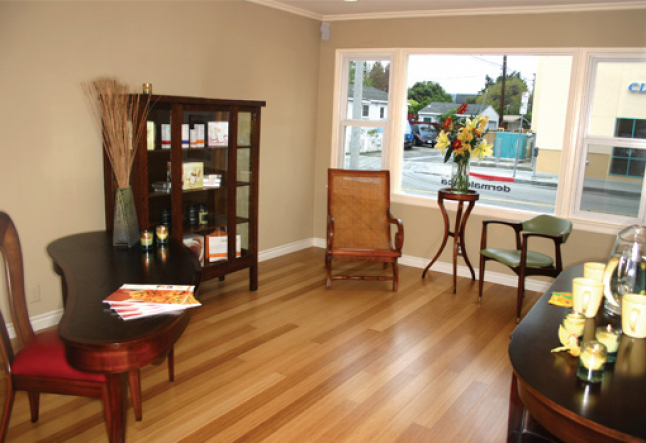 When you’re a designer who loves a good facial, there’s nothing more appealing than a day spa with an empty reception room and a proprietor who offers to trade you free facials for a new design. 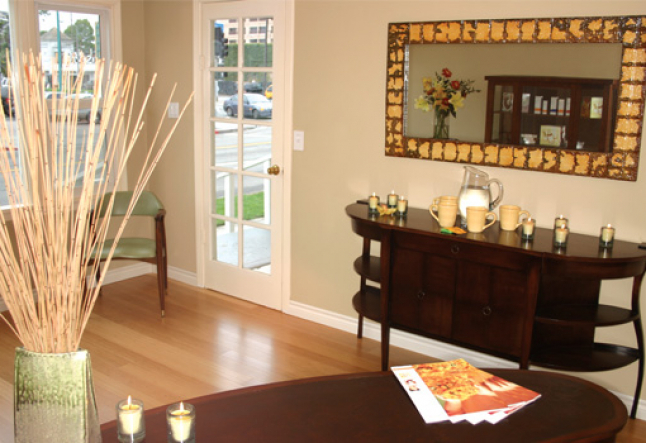 We asked Tera Wilson of Tera Mai Spa if she’d be interested in going green in the room where her clients would be welcomed before going in for treatments. Though at first, she charmingly thought that we wanted to use the color green, she was game for it when we explained what we really wanted to do. “The room needs to be done; it might as well be done right” she agreed. Not only did it need to be done, it needed everything-from flooring to furnishings. 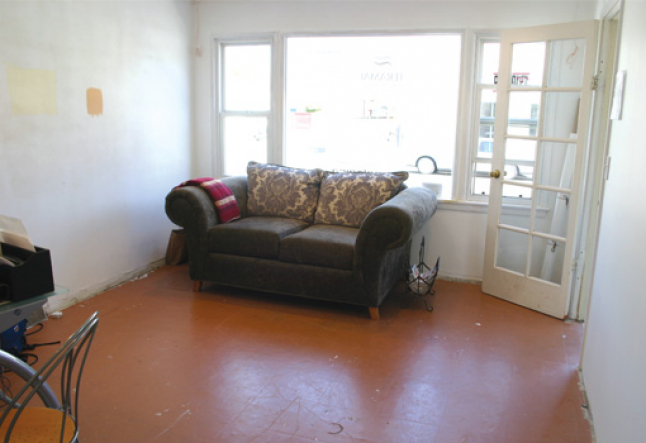 At the moment, it accommodated only a desk and a loveseat which Tera was desperate to return to its rightful home, her living room. The first project to tackle was the floor. We wanted something very special so our friend, Brian, at Builder’s Bamboo recommended a brand new Plyboo product; a bamboo floor that they call “Neopolitan” for its contrasting shades or light and dark pieces. The moment that we saw the sample we knew it was what we were looking for: organic, interesting and beautiful. The bad news; it won’t be available for another 2-6 months - far too late for this project. We promised to try it out in the spring and then decided on an equally lovely edge grain bamboo floor, which we had in less than a week. Tera wanted the room to feel warm and inviting. A color was selected from the richest parts of the floor and painted on the accent wall that would soon be behind the reception desk. 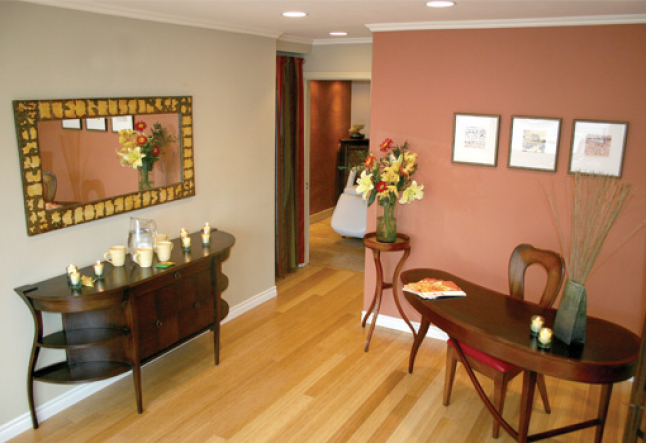 A warm, neutral shade was chosen for the other three walls. We ordered the colors in Anna Sova’s Healthy Wall Finish (our favorite), the brilliant food-grade paint with zero VOCs. Safecoat paint was used for the trim and moldings, where a semi-gloss was needed. Water and tea are served to clients from the stunning, art-nouveau style “Angelina” buffet from South Cone. The buffet’s siblings, an amazing desk, chair and pedestal table, are also in the room. The pieces were chosen for their soft, graceful lines and for the fact that the company uses over 75% FSC Certified Wood in their furnishings and founded PATS (Partnership and Technology in Sustainability.) A side chair with similar lines was found at Loft Appeal, located in downtown Los Angeles; their basement is a great place to find pieces from old movie sets as well as vintage and antique furnishings. A mirror, framed with antique ceiling tiles, from Olde Goode Things, hangs above the buffet and waiting clients recline on a second-hand plantation chair. “I’ve changed my whole concept as a result of this experience” said Tera. “We’re now offering holistic, natural body and skin care treatments.” The Dr. Hauschka Holistic Skin Care products are also available for sale in her beautiful reception room; displayed, by the way, in an antique glass cabinet, circa 1925.